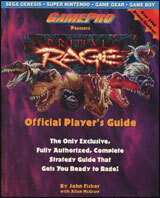 Primal Rage for Super Nintendo is an arcade dinosaur fighting game. Play as any of the seven dinosaurs with unique attributes. There are a variety of moves and combo attacks to learn. There are also three different playing modes. Enjoy the new animated opening and victory scenes.